Another cheap way is the train, however, had a friend who took the train and his trip was delayed for over half a day. We cannot take the risk as we only have 5 days, and 2 days will be the traveling there and back. Anyway, we were psyched to find out about the direct bus from Bangkok to Siem Riep, but several sources indicated that the route was canceled due to “some problems.” Mixed messages here and there, canceled, postponed, running, I need confirmation! Fortunately, found a forum saying that the bus route supposedly became operative on February 21st, 2013 and it sounded solid enough for us. Of course there’s not much information assuring this bus service online, or how to purchase tickets, so we decided to find out for sure by going to Mochit station. I had called beforehand just because it was so hot outside and wanted to avoid a wasted trip but the attempted calls were to no avail, so we just took off to Mochit. Arrived at Mochit on 3rd floor, and were bounced back and forth to a few booths until, alas, we found the ticket booth for Bangkok to Siem Riep! Yippeeeeeeeeee. The right booth is on the 1st floor, and looks like this. Another way to notice it, is the LCD sign (not featured here) which helped us to finally find it after the 4th or 5th person finally pointed us to the right booth. Once we arrived at the booth, we informed the staff of the date we would like to travel and then we picked seat numbers. Make sure to bring your passports just in case, although they don’t check it too much. You just have to let them know your name and passport numbers, which will be presented on your tickets. The ticket also doubles as a meal ticket (probably more like snacks,) so don’t throw it away and keep it around after boarding the bus. 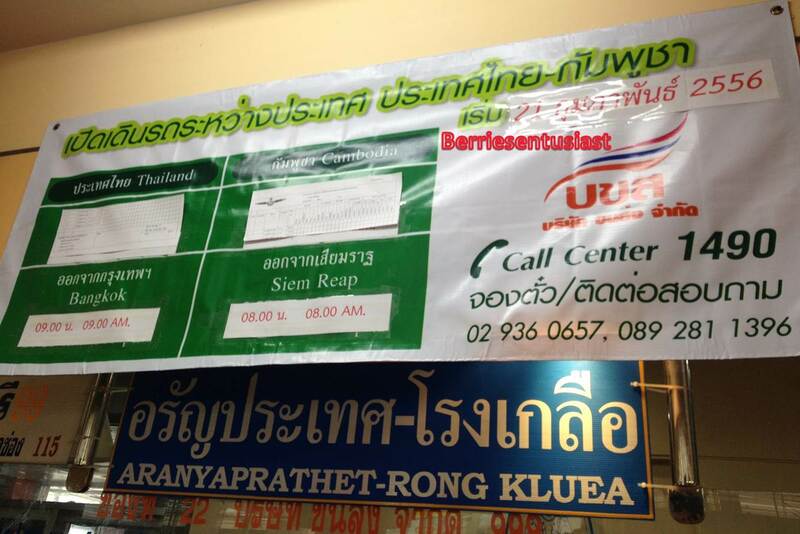 Hope this was useful, and now you know the mythical bus route “Bangkok – Siem Reap” does exist! Food update: The food on the bus was horrible, word of advice, bring your own food. It’s gonna be a 8-9 hours journey. For convenience, there’s a huge 7-11 at Mochit Station for you to stock up on some food. Thanks so much for posting this info! It’s the most thorough I’ve found and I’ll be trying this route out in a couple weeks! You’re very welcome 🙂 Enjoy your trip! Thank you so much for this post.. I am going on this trip in a few days and this was Sooooo great to have this info! You’re welcome! If there are any changes please let me know, so I can update other travelers too 🙂 Enjoy your trip! I wanted to get the tickets in person to confirm everything, but maybe I’ll but them online after all. I have been trying all day to book the bus ticket from the link provided. For some reason the user ID and password never seems to get accepted. Is there any other site from where we can do the booking? That’s the only website I am aware of. Perhaps you need to try inserting numbers or special symbols in the password. I was on the website and it is not very stable, sometimes you just need a different browser or just try another time for it to work properly. Hope you can get it to work! 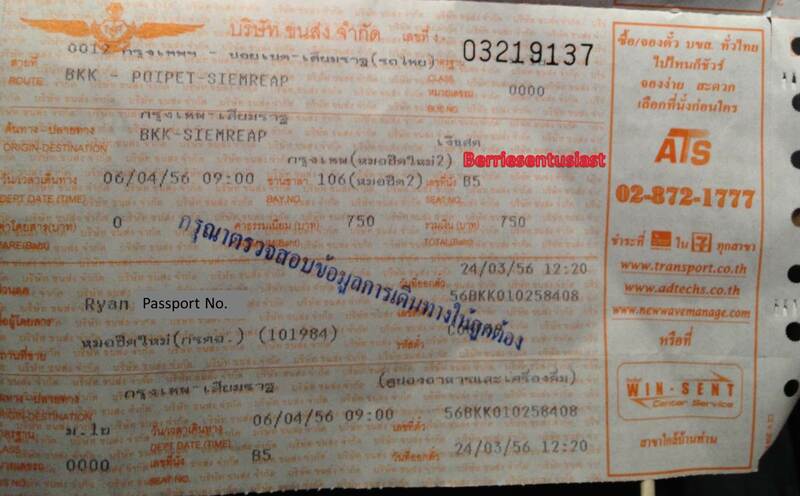 How much bus costs from Siam Reap to Bangkok?and what time bus depart from siam reap? 28 dollars as of April 2013, it departs at 8 am. No problem! Hope you enjoyed your trip!